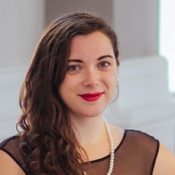 Siena is a Government Relations Associate who works with NETWORK lobbyists and coalitions to advance federal policies inspired by Catholic Social Justice. She focuses on the issue areas of healthcare, housing, living wages, and family-friendly workplaces. She graduated from Regis University with a degree in Politics and a minor in Peace and Justice Studies. Her experiences of debating competitively, teaching middle school, and working with local civil rights organizations inspired her to join NETWORK. Where do she find inspiration for her work: •	Working in a community of justice seekers that is deeply committed to economic and social transformation •	Hearing the stories of people affected by injustices •	The strength, resilience, and grace of activists who have come before me What she loves to do outside of work: •	Yoga •	Hiking •	Thrifting and upcycling Originally from: Lafayette, Colorado Why she loves DC: She loves being in a city where so much important history has been made, and is excited by all the opportunities to explore museums and monuments in her free time.